He was born in Suwalk, Poland. He made his way to the United States and lived in Boston, Philadelphia, and finally New York. He wrote In Gold We Trust. He also penned a few other works in English. However, he made a name for himself as a campaigner for vegetarianism. He contributed a series of articles on this topic to the Hebrew and also to the American Yiddish press—in G. Zelikovitsh’s Idisher odler (Jewish eagle) in Boston (1895). He authored a book on vegetarianism in English entitled Thou Shalt Not Kill, or the Thorah of Vegetarianism (New York, 1896), 85 pp. He later adapted it in Yiddish as Loy tirtseḥ, an obhandlung iber vegetaryanizm (Thou shalt not kill, a treatise on vegetarianism), 2 parts (New York, 1899), 55 pp. and 79 pp., third part (1903), 96 pp., fourth part (Hebrew Publishing Co., 1904? ), 94 pp. Sources: Zalmen Reyzen, Leksikon, vol. 3; the American Jewish yearbook (English) (New York, 5666). He was born in Meretsh (Merkinė), Vilna district. He was raised in Druzgenik (Druskininkai) and Bialystok. In 1903 he came to the United States. Over the years 1907-1910, he worked as a principal in YIKO (Jewish Cultural Organization) schools. He began work as a journalist with articles for Vilna’s Haolam (The world) in 1910. From that point, he contributed to various Hebrew and Yiddish periodicals. In 1913 he served as the correspondent from the land of Israel for Varhayt (Truth) in New York—using the pen name “Independent.” In 1915 he published in New York a Hebrew-language weekly newspaper Hauma (The nation); served as a member of the editorial board of Hayom (Today) and Hadoar (The mail); was assistant editor of Hatoran (The duty officer) (1916-1917); and co-edited Idish folk (Jewish people) (1920-1921). In 1918 he joined the Jewish Legion and visited the land of Israel for a second time, and there he translated Colonel John Henry Patterson’s book Bemeon arayot (In the lions’ den [original? : Tsavo Man-Eaters]). He died in New York. Sources: Zalmen Reyzen, Leksikon, vol. 3; M. Ḥezkuni, in Yizkor-Hadoar (New York) (Sivan 3 [= May 22], 1947). He was born in Vodzhislav (Wodzisławia), Kielce district, Poland, into an affluent family. He received a Hassidic religious education, leaving his hometown when quite young and settling in Warsaw in 1886. There he joined a circle of followers of the Jewish Enlightenment. He acquired secular learning as an autodidact. In 1888 he was part of a Jewish group of the Polish revolutionary party “Proletariat” and with the union of Jewish commercial employees. Outwardly, this group was known as the “Society for Knowledge and Art of the Jewish People.” In this period, Frenk translated Polish revolutionary literature. Soon he was approaching organized Jewish society, and he began his writing career in the Haasif (The harvest) anthologies, under the editorship of Nokhum Sokolov, and in other journals. In the six volumes of Haeshkol, the general encyclopedia in Hebrew, edited by Yitsḥak Goldman, he published articles on Polish and Polish Jewish history. Frenk felt a certain connection with the editor, as he too was active in aid to the Poles in their struggle for independence, writing appeals in Hebrew on behalf of their uprising. At the same time, Frenk wrote feuilletons for Hatsfira (The siren), but the editor Ḥ. Z. Slonimski was too conservative for him. He thus found an excellent place for his fighting nature in Hamelits (The advocate). A. Tsederboym usually published three times each week Frenk’s sharp correspondence pieces and journalistic articles (using the pen names Paneaḥ and Natan). Over the years 1904-1905, he contributed work to Hazman (The times), and later he became a regular contributor to Haboker (This morning), edited by Dovid Frishman (David Frischman), hiding behind the pseudonym ״ki or F-k. When Hatsfira was revived in 1911, Frenk became a member of the editorial board and was considered among its principal writers. When WWI broke out, he and Froym Zinger edited the newspaper, filling out its columns virtually alone with editorials, feature pieces, journalism, and chronicles. Warsaw found itself on one occasion under German occupation, and the financial condition of Hatsfira was such that Frenk took on his own shoulders the heavy yoke of the newspaper until 1916. When later under the severe Russian censor and then the German one, he suffered a nervous collapse which left its vestiges with him till the end of his life. In 1917 Hatsfira was again revived as a weekly, but Frenk was not even invited be a member of the editorial board. When in 1918 Yitsḥak Grinboym returned from St. Petersburg to Warsaw and was appointed editor-in-chief of the newspaper, Frenk actually was editing it. In 1929 Hatsfira again became a daily newspaper, and Frenk, unable to realize his ambition to serve as chief editor of a daily newspaper, was satisfied publishing articles, and because he was terribly bitter, he signed his name “Nidaḥ” (repudiated, banished) and “Gole” (exile). Vexed by his conduct, the editorial board forbid him from using these pseudonyms. Frenk then relinquished his journalistic activities in the Hebrew-language press and turned his attention to writing history of Jewish life in Poland. Over the course of his journalistic activities, Frenk also contributed to Yiddish newspapers and journals. In Yiddish he debuted in print with a sketch entitled “Moneshekh” (One or the other) and an article against Ben-Avigdor’s Sifrei agora (One-penny books) which he published in Perets’s Yidishe biblyotek (Yiddish library) 2. He later wrote stories, feature pieces, journalism, literary criticism, and historical essays: for Perets’s Literatur un lebn (Literature and life) and Yontef bletlekh (Holiday sheets); “Der yidisher firsht, don yoysef nosi” (The Jewish duke, Don Yosef the Prince) in Spektor’s Hoyz-fraynd (House friend) 3, and “Makhmed un di yidn” (Mohammed and the Jews) in 5; Yid (Jew); Di velt (The world); Tsayt (Times) in Vilna; Yatskan’s Tageblat (Daily newspaper) and Haynt (Today); Krinski’s Roman-tsaytung (Fiction newspaper); Di naye velt (The new world) in 1909; M. Y. Freyd’s Der shtrahl (The beam [of light]); and the weekly newspaper Dos yidishe folk (The Jewish people) in 1917. In the last years prior to his death, he published in Haynt right up to the day of his passing installments of his series “Epizodn fun der geshikhte fun yidn in varshe” (Episodes from the history of Jews in Warsaw). The bitterness and pain that Frenk felt for those with whom he had been associated in the Hebrew press in Poland, he expressed in an article which also appeared on the day of his death in Haynt under the title “Vegn dem kiem fun a hebreisher tsaytung in varshe” (On the existence of a Hebrew newspaper in Warsaw). Over the course of forty years of his literary work, Frenk also excelled as a translator. His Yiddish translation of Bolesław Prus’s Pare (Pharoah [original: Faraon]) appeared in several editions and was later published under the title Kroyn fun mitsraim, historisher roman (Crown of Egypt, a historical novel) (Warsaw: A. Gitlin, 1918), 3 vols. His translation of Mirtala (Mirtala) (Warsaw: B. Shimin, 1911; Warsaw: Tsentral, 1912), 194 pp., a novel by Eliza Orzeszkowa, was extremely successful. Frenk adapted this same work for young people in Hebrew (Warsaw, 1924). Into Yiddish he also translated the novel by Hall Caine, Dos kapore hindl (The scapegoat), concerning Jewish life in Morocco, in Yidishe familye (Jewish family) (1902). His translated two works by Henryk Sienkiewicz, Beesh uveḥerev (Fire and sword [original: Ogniem i mieczem]) (Warsaw: Shtibl, 1920-1921), in three volumes, and Hamabul (The flood [original: Potop]) which was never published—two parts of it remained in manuscript at the time of his death. His published translations later appeared in numerous editions in Israel with linguistic improvements which had to be made in connection with developments of the Hebrew language. Frenk also translated into Hebrew Grace Aguilar’s Ganon vehatsel (Ganon and the rescuer) (Warsaw, 1893), 23 pp. and Robert Zandek’s one-act play Yehudonim (Yids) (Cracow, 1907). Remaining in manuscript were several Yiddish dramas, among which was also the historical drama entitled Temerl (Little Tamar), built on the legends and facts in the life of Shmuel Zbitkover and his family (the first act of the play was published in Haynt 94-98 ). In journalism, he also contributed to the liberal Polish newspapers of his day and infused his work with the patriotism of the Polish Jew. Frenk’s historical writings have enduring value, although they do not always withstand the test of modern scholarship. Important also was his work as a historian, because the archives that Frenk drew on, documents for his writings, are now, after WWII and the Nazi liquidation of every trace of Jewish culture in Poland, no longer in existence. He began his work as a historian with the historical novel. His book Meḥaye haḥasidim bepolin, sipur (From the lives of Hassidim in Poland, a story) (Warsaw, 1895), 92 pp., depicts in living and colorful imagery life in the Hassidic realm, in which he grew up. Prominent from a fictional standpoint was Frenk’s Yitsḥak meir beyalduto (Yitsḥak Meir in his childhood) (Warsaw: Tushiya, 1904), 141 pp., in which the Polish Hassidim found their true painter, which reflected the daily lives of Polish Hassidim, their children’s education, their customs, weddings, and the like. Although Frenk himself withdrew from Hassidic environs, he made use of Hassidic themes his entire life (his Hassidic stories in Yiddish have still not yet been collected). Frenk collected all manner of legends and stories and adapted them for young people under the title Agadot haḥasidim (Tales of the Hassidim) (Warsaw: Barkay, 1923); he also adapted legends from the Zohar and published them under the title Agadot hazohar (Tales of the Zohar) (Warsaw: Aḥiasef, 1923), 2 volumes. He reworked a portion of this material for youth as Mivḥar agadot haḥasidim (Selection of tales of the Hassidim). He himself did not live to see these works in print. The volume appeared in print initially in Warsaw in 1924 and subsequently in Tel Aviv in numerous editions, the most recent in 1954. From works of historical fiction, Frenk moved to genuine historical research, specializing in the history of Jews in Poland in the era of the Duchy of Warsaw (1806-1813) and Congress Poland (1815-1830). His historiographical work was based on documents from Jewish community archives, and around these he weaved a network of tales and legends. He began with the work “Letoldot haḥazaka” (On the history of the right of possession) in Hashiloaḥ (The shiloah) 2, in which he documented the development of “Ḥazaka” (right of possession) on the basis of a series of precepts whose full versions he cited from the records of Apte (Opatów). The finest of his historical writings Vnutrenniaia zhizn’ evreev v Pol’she i na Litve 17 and 18 vekov (The inner life of Jews in Poland and Lithuania in the seventeenth and eighteenth centuries), which was published in Istoriia Evreiskogo Naroda (History of the Jewish people), vol. 11 (St. Petersburg: Mir, 1914). In his book Haironim vehayehudim bepolin (The burghers and the Jews in Poland) (Warsaw, 1921), Frenk described the continual struggle between the Jews and the townsmen (mieszczanie) in various Polish cities and particularly in Warsaw concerning residential and commercial rights until 1795. His work Meshumodim in poyln in 19tn yohrhundert (Apostates in Poland in the nineteenth century), 2 volumes (Warsaw: Y. Freyd, 1923-1924) initially appeared in a lengthy series of installments in Haynt. Of the works that Frenk composed on the basis of archival documentation, we need to mention Di familye davidzon (The Davidsohn family), with Y. Ḥ. Zagorodski (Warsaw: Freyd, 1924), 105 pp. In the Warsaw archives, Frenk discovered statistical lists of Jews and their employments for the year 1843, and he used these findings in a work he published in Bleter far yidisher demografye, statistik un ekonomye (Jewish demography, statistics, and economics). Of his other works in Yiddish, he published in book form: Der alfonsn pogrom in varsha (The Alfonsn Pogrom in Warsaw) (Warsaw, 1908), 22 pp.—concerning the bloody revenge Jewish workers exacted on the pimps and underworld types; Di geshikhte fun yidn in poyln (The history of Jews in Poland) (Warsaw: Yehudiya, 1910). In historiographical work, he was strongly influenced by his own journalistic work in the ease of writing and formulating. Irrespective of the considerable number of faults, Frenk’s historical research was of great importance and contributed to the expansion of historical knowledge concerning the Jewish past in Poland. Sources: Zalmen Reyzen, Leksikon, vol. 3; Sh. Rozenfeld, in Tsukunft (New York) (April 1924), pp. 231-33; Rozenfeld, Geklibene shriftn (Selected writings) (New York, 1947), pp. 229-38; Z. Sigal, Gehstaltn (Images) (New York, 1928), pp. 134-44; Y. Nisnboym, Ale ḥeldi (Pages of my world) (Warsaw, 1929), pp 304-5; Professor M. Balaban, Yidn in poyln (Jews in Poland) (Vilna, 1930), pp. 314-19; Yankev Shatski, Geshikhte fun yidn in varshe (History of Jews in Warsaw), vol. 3 (New York, 1953), pp. 80, 243, 287, 310, 398; Entsiklopediya shel galuyot (Encyclopedia of the Diaspora), vol. 1 (Warsaw, 1953), pp. 467-95; Pinkes varshe (Records of Warsaw), vol. 1 (Buenos Aires, 1955), pp. 13, 814; Yosef Likhtnboym, Hasipur haivri (The Hebrew story) (Tel Aviv, 1955), p. 523; Shmuel Kalman Mirsky, Ishim udemuyot beḥokhmat yisroel beeropa hamizraḥit (People and images of Jewish wisdom in Eastern Europe) (New York, 1959), pp. 199-224; Getzel Kressel, Leksikon hasifrut haivrit (Handbook of Hebrew literature) (Merḥavya, 1967), p. 582. He was born in Vilna, Kovno district, Lithuania. He graduated from a Yiddish-Hebrew high school. Until 1935 he studied in Dr. Esther Eliashev’s courses at the Jewish people’s university in Kovno. He debuted in print with sketches and stories in Folksbat (People’s newspaper) in Kovno (1933). Over the years 1934-1935, he published in it in installments his novel Bay di bregn fun nyeman (By the shores of the Nieman [River]). Since WWII there has been no information about him. Sources: Dr. Esther Eliashev, in Folksblat (Kovno) (September 12, 1934); information from Yudel Mark in New York. He was born in New York, and in addition to public schools, he studied in “Bet Sefer Leumi” (National [Hebrew] school). In 1933 he graduated from the Jewish teachers’ seminary and worked at Jewish schools in New York and Washington. He received a Bachelor of Arts degree in social sciences and a master’s degree in modern history and economics. He also completed the course work for a PhD, but never submitted a dissertation. Over the period June 1941-March 1943, he worked in the federal business administration in Washington as an assistant analyst doing economic research. He was national director for information, 1945-1947, of B’nai Brith and edited the monthly periodical Bney bris nayes (New from B’nai Brith) as well as two editions of the yearbook Dos iz bney bris (This is B’nai Brith) (1946-1947). From 1941 he was the Washington correspondent for Morgn-zhurnal (Morning journal), and from 1953 for Tog-morgn-zhurnal (Day-morning journal)—both in New York. For 1946 and 1947, he also corresponded for: Di yidishe tsaytung (The Jewish newspaper) in Buenos Aires; Davar (Word) in Tel Aviv; Jewish Chronicle in London; and for the Palkor News Agency in New York. He began publishing in Yiddish in Der amerikaner (The American) in New York (spring 1930). He published poems in: Fraye arbeter shtime (Free voice of labor), Untervegs (Pathways), and children’s poetry, stories, and children plays in Kinder-zhurnal (Children’s magazine)—all in New York. He also contributed to Hadoar (The mail) and Yivo-bleter (Pages from YIVO), as well as to other publications in Yiddish, Hebrew, and English. Thanks to his efforts with the American State Department, 1800 Jewish refugees over the years of WWII were admitted to the United States in accordance with a special law. In government circles in Washington, Frenk was an authority on Jewish matters. He was an official representative of the Yiddish press at important press conferences, given by senators, congressmen, and high government officials. Through his acquaintances with members of Congress, he furnished a great deal that enabled the U. S. Congress to recognize the slaughter of Jews on humanistic grounds. He was a Jewish correspondent with an international name and a community leader with broad stature. He died in Washington. He published in book form: Medines yisroel in undzere teg, reportazhn (The state of Israel in our time, reportage pieces) (Tel Aviv: Nay-lebn, 1972), 204 pp. Sources: Sh. Ts. Lerer, in Yidishe prese (Buenos Aires) (September 14, 1958); Y. Shtshavinski, in Yidish tsaytung (Tel Aviv) (April 2, 1965); Who Is Who in Commerce and Industry; Who Is Who in World Jewry. He was born in Zamość, Poland. After WWII he lived in the displaced persons camp in Feldafing for Holocaust survivors, near Munich, West Germany. He contributed articles to the Munich press for survivors. In 1947 he edited the political section of the newspaper Nayvelt (New world) in Munich. He was last living in the state of Israel. He was born in Lodz, Poland. He received a Jewish and a general education. Until 1918 he was active in the unified Zionist Socialist party, later switching to the Communists. He worked as a Yiddish teacher in Vilna and Warsaw. He spent many years in Polish prisons, and in 1932 he was expelled to Russia. There he assumed leading positions in political and Jewish cultural life, mainly in Minsk. He began writing for the party press of the Zionist Socialists: Der veg (The way) and Unzer veg (Our way) in Warsaw. From 1918 he was contributing to: Der kamf (The struggle) and other illegal publications in Warsaw; and Literarishe tribune (Literary tribune) and Der fraydenker (The freethinker) in Lodz. He edited the weekly newspaper Der glok (The bell) in Warsaw (1921). In the Soviet Union, he wrote for: the newspaper Oktyabr (October) in Minsk; Emes (Truth) and Der apikoyres (The heretic), among others, in Moscow; and co-edited the anthology Lenin kegn bund (Lenin against the Bund) (Minsk, 1935). He was among the first arrested in connection with the show trials of Communists who had managed to make their way from Poland. He committed suicide in a jail in Minsk. Sources: Khayim Leyb Fuks, in Fun noentn over (New York) 3 (1957), see index; Unter der fon fun kp״p (Under the banner of the Polish Communist Party) (Warsaw, 1959), pp. 197, 198, 326, 364; Chone Shmeruk, comp., Pirsumim yehudiim babrit-hamoatsot, 1917-1961 (Jewish publications in the Soviet Union, 1917-1961) (Jerusalem, 1961), see index. He was born in Zgerzh (Zgierz), near Lodz, Poland, into a wealthy Hassidic family. In 1862 he moved with his parents, Shoyel and Freyde-Beyle, to Lodz, where he would live until 1881. Lodz had a large impact on his life and work. His father, a major textile manufacturer, was reputed to be a follower of the Jewish Enlightenment. He was close to the local writers’ circle. Such writers as Tsvayfel, Gotlober, and others came to visit at their home. Dovid studied with the best teachers and tutors both Jewish subject matter (even Kabbala) as well as secular subjects and foreign languages. From his father he inherited his critical-analytical mind, and from his mother the idyllic-lyrical sensibility—as he would later write in his autobiography in 1892. He had at age nine already demonstrated the nature of a book-worm. At fourteen, he composed poems and stories in Hebrew and Yiddish, and he made his first Hebrew translation from German; like his familiar “Lodz Yiddish,” German was like his mother tongue. Among other items, he wrote the satirical poem “Der shtiler neyder” (The silent vow) in Yiddish and translated the first part of Dumas’s Count of Monte Cristo into Hebrew, but he debuted in print in literature with the short story “Hamore derekh” (The guide), signed “D. F.,” in Smolenskin’s Hashaḥar (The dawn) 9 (1878). With his full name, he would later publish the poem “Letovat haklal” (For the good of the collective) in Hashaḥar. In those years he also contributed to Deutscher Lodger Zeitung (German newspaper of Lodz). Due to the impoverishment of his family, he left Lodz and until 1883 lived in Berlin, where he met German Jewish writers, first and foremost Aharon Bernstein who influenced him to translate into Hebrew his [Bernstein’s] four-volume work Naturwissenschaftliche Volksbücher (Popular work on natural science), which appear as: Yediot hateva (Information on nature) (Warsaw, 1882-1885). Frishman also wrote at this time for the publication Junges Deutschland (Young Germany) and in Leopold von Sacher-Masoch’s Auf der Höhe (At the pinnacle) in Berlin. In 1883 he returned to Poland and settled in Warsaw, and from this point in time he began to concentrate on literary criticism. That year he published the pamphlet Tohu vabohu (Chaos) (Warsaw, 60 pp.). With persuasive clarity here, he came out against the excessively florid prose style, hollowness, and inefficiency of Hebrew literature, primarily against the group of Lilienblum, Yehalel (Yude-Leyb Levin), Smolenskin, Tsederboym, and the journal Hamelits (The advocate). The pamphlet, on the one hand, established him among the first fighters for new form and content in Hebrew literature, and, on the other hand, he suffered attacks by the writers he had himself assaulted. This pushed him to gloom and despair, but he went on writing articles, poetry, and stories, and published them in a variety of works, among them: Sokolov’s anthology Haasif (The harvest) (Warsaw) 1 and 2 (1885-1886)—among these writings, the first of his well-known “Otiyot porḥot” (Promises unfulfilled). In 1885 he was invited to come to Leipzig and join the editorial board of Hayom (Today), where almost daily he published editorials and the feuilleton series “Otiyot porḥot” (for a short time under the title “Bakol mikol, kol” [Lock, stock, and barrel]), the first of its sort in the Hebrew press. Without a doubt, they were a step in the progress of Hebrew literature and the press. Frishman also published there the profoundly critical essays “Mikhtavim al dvar hasifrut” (Letters on literature). During his St. Petersburg period, he became friends with Sholem-Aleichem. The latter also influence him to write in Yiddish. Sholem-Aleichem invited him to contribute to his Folks-biblyotek (People’s library), that he was conceiving at the time, and Frishman gladly accepted. Inasmuch as the publication initially appeared in print in 1888, in the interim Frishman went ahead and published his first Yiddish poem, “Afn bergl” (On a hillside), in Dr. Y. L. Kantor’s Dos yidishe folksblat (The Jewish people’s newspaper) of 1888, supplement 3 (in the same issue that Sh. Frug debuted in print in Yiddish, and the two men drew closer. He later published in supplement 26-28 his story “Haskores neshomes” (Custom of praying for the souls of deceased relatives on specific holidays), and this is generally accepted as the beginning of his literary activities in Yiddish. In Sholem-Aleichem’s Yidishe folks-biblyotek (Kiev) 1 (1888), he published the Yiddish version of the poem “Ofir” (Ophir), which he had written earlier in Hebrew but had been left in manuscript. The poem, in blank verse and a searching language, caused a huge stir and inscribed a date in the history of early Yiddish poetry. Also, because “Ofir” appeared in the same collection as Y. L. Perets’s “Monish,” perhaps unwittingly people compare both first Yiddish poems as the debuts of two fames Hebrew writers. There were some who considered “Monish” as a great poetic achievement. Others and Sholem-Aleichem himself praised Frishman’s “Ofir” more, and it was at this time that the dispute between Frishman and Perets began. Although Frishman had disdain for Yiddish, at this time (1889) he still wrote 130 poems in Yiddish, as he expressed it: “Lyrical poetry, on motifs of love, nature, and longing, which none of the zhargon [= Yiddish] writers from Elye Bokhur to Eliakum Tsunzer (Zunser) have written very well”; and “they are the best of all that I have written.” He asked also to find someone in Kiev to publish these poems. (Frishman’s Yiddish poems were never published in book form, although in 1914, at the time of a celebration for him when a portion of his Yiddish writings were being published, he did prepare such a volume for publication. And, perhaps the manuscript was lost during the war in 1914, when Frishman was evacuated to Odessa and later to St. Petersburg?) A number of his poems were published in Dos yidishe folksblat in St. Petersburg (1889) and in Spektor’s Hoyzfraynd (House friend) (Warsaw) 2 (1889). Aside from poems and stories, he also published reviews (“Fun mayn sforim-tishl” [From my desk with religious texts]) of Mendele, Sholem-Aleichem, Spektor, and Sh. Bekerman—these constitute his first works of literary criticism in Yiddish. In 1890 he again left the country, and until 1895 studied history, national economies, and art history at Breslau University. He then returned to Poland and settled in Warsaw. He translated into Hebrew for the publisher Aḥiasaf scholarly and fictional writings, as well as children’s literature, among them: George Eliot’s Daniel Deronda, Schumacher’s Berenice, and Lippert’s Kulturgeschichte der Menschheit in ihrem organischen Aufbau (Cultural history of humanity in its organic structure). He also published a volume of his new Mikhtavim al dvar hasifrut. In this same period, he contributed to the Lukhes (Calendars) put out by Aḥiasaf, Hashiloaḥ (The shiloah), and Hoyz-fraynd 5 and 6. He renewed his attack on Perets and his radical socialist Yontef bletlekh (Holiday sheets) and published two sharp pamphlets: Lokshn (Noodles) and A floy fun tishe bov (A flea on Tisha b’Av), a dark, jumping, living, biting leaflet (Warsaw, 1894), 16 pp. and 30 pp., respectively (using the pen name Avrom Goldberg). Over the years 1889-1901, he lived in Lodz. He worked as an agent for an insurance company. In those years he published in Naye lodzer tsaytung (New Lodz newspaper). Later, back in Warsaw, he served as editor of the weekly Hadoar (The mail), which was the best edited Hebrew journal of its time. In 1904 he was again editing Hadoar, but the journal did not last very long. Frishman then turned his full attention once again to translations of European literature: Andersen, Spielhagen, Pushkin, Byron, Goethe, and others. In between, he edited for a time the weekly Hazman (The times) in St. Petersburg, Hazman in Vilna, and later the anthologies Sifrut (Literature) and Reshafim (Sparks) (1901-1911). Among other items, he published in these volumes his translation of Nietzsche’s Thus Spake Zarathrustra (as Ko amar saratustra). From 1902 he became a frequent contributor to the awakening Yiddish press and periodicals. He wrote poetry, stories, and feature pieces for: Der yud (The Jew) in Warsaw-Cracow (among other items, the play Far meshiekhn [For the Messiah]), the daily newspaper Der fraynd (The friend) in St. Petersburg, the collection Hilf (Help) in Kiev (his poem “Daniel in leybngrub” [Daniel in the lion’s den], written after the Kishinev pogrom), the daily newspaper Der veg (The way) in Warsaw, Di tsayt (The times) and the Bundist daily Folkstsaytung (People’s newspaper) in Vilna, Shmuel-Yankev Yatskan’s Dos idishe vokhenblat (The Jewish weekly newspaper)—in 1907; Di naye tsayt (The new times), the first collection of young writers (Warsaw, 1907) of which he was also co-editor; Der land-shadkhn (The regional matchmaker) and Di yunge velt (The young world)—in 1908; and Der shtrahl (The beam [of light]) of 1910; among others. With the founding of Haynt (Today) on January 22, 1908, Frishman became and remained a contributor to this newspaper until his death. He introduced herein for the first time in the Yiddish press the political and social feuilleton, initially in the form of flyers and later every Friday, as a polished essay; the series “Unzere literaturn” (Our literatures), which at the time aroused bitterness in Yiddishist circles and his polemical attacks in connection with the action pursued by Perets, together with other Yiddish writers and community leaders, for a modern Yiddish theater. Opposed to him were, among others: H. D. Nomberg and A. Litvak. Following Perets’s death, Frishman wrote of him in an altogether different tone, although he did not renounce all the complaints he bore toward Perets. In 1911 and 1912, he traveled on an excursion for Haynt to the land of Israel, and he published concerning it a series of articles in: Haynt, Hatsfira (The siren), and Di tsayt in London. In late 1914, during the war, he moved to Odessa and published feuilletons in Unzer lebn (Our life); he was later a contributor to Petrograder togblat (Petrograd daily newspaper), the anthology Untervegs (Pathways) in Kiev, and other Yiddish and Hebrew publications in the Russian empire. After the 1917 Revolution, he made his way to Moscow and there edited the first three volumes of the anthology Hatekufa (The epoch); later, in Warsaw he edited the subsequent six volumes. In addition to stories, poems, and articles, he published in them a great number of his own translations, such as: Homer’s Iliad, Goethe’s Prometheus, Tagore’s The Gardener, Heine’s Die Nordsee (The North Sea), Anatole France’s Thaïs, and Byron’s Manfred and Heaven and Earth. In early1919 he returned to Poland and lived there until the middle of 1920, after which he settled in Berlin. He continued contributing work to Haynt in Warsaw, and to Morgn-zhurnal (Morning journal) in New York, and in addition to feuilletons he also published his biblical stories from the series “Midbar” (Wilderness)—it is clear from these just how original a storyteller he was. Throughout his life he strove and here in distant biblical antiquity, with its passion and wild heroism, he was able to give voice to one of his strongest works. He had the capacity and purpose to become one of the most original Yiddish writers, and he did become a stylist in Hebrew, working intensely and wholeheartedly with the goal of publishing his entire corpus in forty volumes. He became ill with cancer, suffered terribly for a lengthy period of time, and did not live even to see the beginning of his dream. He died in Berlin. Bialik and Bergelson gave speeches at his funeral. Frishman’s Yiddish poems are included in various anthologies and readers, among others: Frayhayt (Freedom), a publication of the Bund (1907); L. Yofe’s Lider farn folk (Poetry for the people) (Odessa, 1908); Y. Fikhman’s Di yudishe muze (The Jewish muse) (Warsaw, 1911); Dovid Kasel’s Antologye (Anthology) (Warsaw, 1913); the Soviet Mut (Courage) (Moscow, 1920) and Lebedik bagrobn (Buried alive) (Kharkov, 1935); Yoyel Entin’s Yidishe poetn, hantbukh fun yidisher dikhtung (Yiddish poets, a handbook of Yiddish poetry) (New York, 1927); H. D. Hurvitsh, Yidishe literatur (Yiddish literature) (Moscow, 1928); M. Basin, Antologye, 500 yor yidishe poezye (Anthology, 500 years of Yiddish poetry) (New York, 1917); and Revolutsyonerer deklamator, zamlung fun lider, poemes, dertseylungen, eynakters, tsum farleyenen, shipln un zingen bay arbeter-farveylung (Revolutionary declamation, collection of songs, poems, stories, [and] one-act plays to read aloud, enact, and sing for workers’ entertainment) (New York, 1933). His Hebrew-language poetry and stories appeared in virtually every Hebrew anthology and textbook. A large number of his novellas and poems have been translated into Polish, Russian, German, and other languages. Frishman also wrote under such pen names as: A. B. G. D., Ipslun, D. F., D. F. M., David, Dan, Yekhiel Ber, Efrati, Heine Hakatan, Meshorer Haluaḥ, D. Shoyelzohn, Mivaker, and Biblyograf. He used these pseudonyms primarily in Hebrew publications: Haasif, Ben-ami (Son of my people), Haboker (This morning), Haboker or (The morning light), Peraḥim (Flowers), Hador (The generation), Hazman, Hayom, Kneset (Gathering), Luaḥ aḥiasaf, Hatsfira, Hamagid (The preacher), Hamagid leyisrael (The preacher to Israel), Moledet (Homeland), Miklat (Refuge), Sifrut, Netivot (Pathways), Reshafim, Ivri anokhi (I am a Jew), Haolam (The world), Haatid (The future), Hashaḥar, Hashiloaḥ, Hatekufa, and Talpiyot (Fortresses). In book form in Yiddish: his first Yiddish collection was Kleynikeyt (Trifles) (Tarnów: A. Rushinovski, 1894), 32 pp., including the stories “Masei” (Journeys [title of a Torah portion]) and “Um yonkiper” (On Yom Kippur), among other pieces, translated from Hebrew with a preface by Frishman which was characteristic of his Enlightenment approach to Yiddish at the time—“One does not pour out impure water before one has the pure—as long as the common people are incapable of an education and of knowing how to acquire a European language, for that long we shall be obliged to provide the same things in the zhargon language”; Dray hobn gegesn um yonkiper, ertsehlung (Three ate on Yom Kippur, a story) (Warsaw, 1905), 14 pp. ; his collected writings (Ale verk) began appearing in 1909 with Ertsehlungen (Stories), 2 vols. (Lodz, 1909), later 3 more vols. (Warsaw-New York, 1911-1914) [see below]—vol. 1, 189 pp., including “Dos kleyne malekhl” (The little angel), “Kidesh-levone” (Blessing the new moon), “Nor eyn shabes” (Just one Sabbath), “Tiskhadesh” (Wear it in good health), “Likht” (Light), “Der golem” (The golem), “Af a zumer-voynung” (At a summer residence), “Bay a seyfer toyre” (With a Torah scroll), “Der kinstler” (The artist), “Ven di toyte voltn kenen reden” (If the dead could speak), “Reb meyer bal nes pushke” (Synagogue charity box), “Vi ikh hob zikh aleyn a pogrom gemakht” (How I made a pogrom all by myself), “Gegesen” (Eaten), “Matses” (Unleavened bread), “Vegen eyn eyntsig pintele” (Concerning one particular point), and “Er iz nifter gevorn” (He has died); vol. 2, 231 pp., including “Tsu kolnidre” (At “Kol Nidre” [prayer beginning Yom Kippur]), “Mates un masei” (Tribes and Journeys [titles of two Torah portions]), “Koperniks gegner” (Copernicus’s opponent), “Der tants” (The dance), “Tikn leyl shvues” (all-night study session on the eve of Shavuot), “Der koyen” (The Kohen), “Hare es” (It’s you), “Haskores neshomes,” “Ekhen in varshe” (A snake in Warsaw), “Sinay” (Sinai), and “Dos letste mol” (The last time); vol. 3, Yidish teater un yidishe literatur (Yiddish theater and Yiddish literature) (Warsaw: Tsentral, 1914), 201 pp. ; vol. 4, Shotenbilder (Silhouettes) (Warsaw: Tsentral, 1914), 173 pp., including articles on Shloyme Rubin, Sholem-Yankev Abramovitsh [Mendele], M. L. Lilienblum, Yehalel, Dr. Y. L. Kantor, Ben-Yehuda, Elkhonen Leyb Levinski, Dovid Ginzburg, Theodor Herzl, David Wolfsohn, Em. Mandelshtam, Menashe Margoles, Tolstoy, Suvarin, Fanny Vadi-Epshteyn, and Madame Lobel; vol. 5, Felyetonen (Feuilletons) (Warsaw: Tsentral, 1914), 240 pp., including travel anecdotes from the land of Israel, Egypt, Monte Carlo, and elsewhere. After Frishman’s death, two further volumes of his feuilletons appeared in print: (1) Vort un bild (Word and image) (Warsaw, 1927), 152 pp; and (2) Milkhome un sholem (War and peace) (Warsaw, 1927), 188 pp. His Yiddish poetry, a great number of his articles, feuilletons, pamphlets, and the series of his biblical tale “In der midber” (In the wilderness) have not been [collected and] published in book form. His wife Lili published Ale verk fun dovid frishman (Collected works of Dovid Frishman) in six volumes (Warsaw, 1929): (1) Geshtaltn (Images); (2) Ertsehlungen; (3) Ertsehlungen; (4) Ertsehlungen; (5) Teater un literatur (Theater and literature); (6) Tsayt-motivn (Topics of the time)—second edition (Warsaw, 1938), third edition (Warsaw, 1939), fourth edition (Mexico City, 1949). His books in Hebrew: Ketuvim nivḥarim (Selected writings) in four volumes (Warsaw, 1899-1905); the first full jubilee edition, Kol kitve david frishman (Collected writings of David Frishman) in eight volumes (Warsaw, 1910-1912); Kol kitve David frishman umivḥar targumav (Collected writings of David Frishman and selected translations) in seventeen volumes (Warsaw: Merkaz, 1914). The last of these includes Sefer habikoret (Volume of criticism) with a biography of Frishman, written by F. Lakhover, and articles on his work by: Dr. Y. L. Kantor, M. Y. Berdichevski, Y. Fikhman, Ben-Eliezer, A. Shteynman, and Y. Beyzits. After his death, two further volumes: (1) Shiva miḥtavim ḥadashim al dvar hasifrut (Seven new letters on literature) (Berlin, 1923), 205 pp. ; and (2) Bamidbar (In the wilderness) (Berlin, 1923), 239 pp. Subsequent volumes published by his wife: Kol kitve (Collected writings), poetry (Warsaw, 1925), 327 pp. ; Igrot (Letters) (Warsaw, 1927), 179 pp. ; Kol kitve david frishman in eight volumes (Warsaw, 1929); Sipurim veshirim (Stories and poems) (New York, 1938); Bamidbar (Tel Aviv, 1940); Mivḥar ketuvim (Selected writings) (Tel Aviv, 1947); and the newest edition of Kol kitve in eight volumes (Tel Aviv: M. Nyuman, 1954-1966). Among these collections, however, is not to be found: his book Baarets (On the land), essays and impressions from his voyage to Israel (Warsaw, 1911), 53 pp. ; Igron shalem (The complete letter-writer), a letter-writing manual in Hebrew, Russian, Polish, and Judeo-German in which is included a short course in simple bookkeeping, with Avraham Yaakov Paperna and Mrs. Hes (Warsaw, 1911), 132 pp. ; Hatḥalat ḥumash (The beginning of the Pentateuch), in language written for children (Warsaw, 1911), 155 pp. 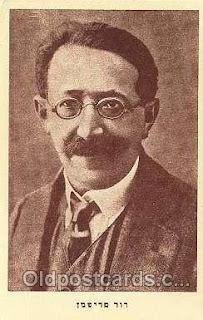 Hillel Tsaytlin published a series of articles entitled “Moyshe rebeynu un zayn redaktor dovid frishman” (Moses and his editor, Dovid Frishman) in Moment (Moment) (Warsaw, 1911-1912), an attack on Frishman due to this last volume; Frishman answered him to the effect that the following sentence was missing: “Only for children who do not have tools to study Torah by chance” (Haynt) in 1912. Sources: Zalmen Reyzen, Leksikon, vol. 3 (with a thorough bibliography in Hebrew and Yiddish until 1928); Frishmans yubileum-bukh, tsu zayn fuftsig-yohrigen geburts-tog (Frishman’s jubilee volume, on his fiftieth birthday) (Warsaw, 1914), 215 pp. ; Shmuel Niger, Lezer, dikhter, kritiker (Reader, poet, critic), vol. 2 (New York, 1928), pp. 406, 559-93; Niger, Kritik un kritiker (Criticism and critic) (Buenos Aires: Argentinian division of the World Jewish Culture Congress, 1959), pp. 346-60; Dr. Y. Shatski, in Pinkes (Records) (New York, 1928), pp. 385-86; Dr. A. Koralnik, Dos bukh fun vortslen (The book of roots) (Warsaw, 1928), pp. 73-78; Koralnik, Babayit uvaḥuts, deyoḳane maḥashavot veishim beyisrael uvaamim (At home and abroad, portraits of ideas and personalities in Israel and its people) (Tel Aviv, 1964), pp. 187-94; A. Gurshteyn, in Tsaytshrift (Minsk) 2-3 (1928); Avrom Goldberg, in Haynt yoyvl-bukh (Jubilee volume for Haynt) (Warsaw, 1928), pp. 19-20; Avrom Reyzen, Epizodn fun mayn lebn (Episodes from my life), vol. 2 (Vilna, 1928), pp. 61-62, vol. 3 (Vilna, 1935), pp. 288-91; H. D. Nomberg, Mentshn un verk (People and their writings) (Warsaw, 1930), pp. 163-67; Nakhmen Mayzil, Perets, lebn un shafn (Perets, life and work), vol. 1 (Vilna, 1931), pp. 205-30; Mayzil, Yitskhok-leybush perets un zayn dor shrayber (Yitskhok-Leybush Perets and his generation of writers) (New York, 1951), pp. 289ff; Mayzil, Tsurikblikn un perspektivn (Retrospectives and perspectives) (Tel Aviv: Perets Publ., 1962), see index; Zalman Shneur, in Forverts (New York) (June 24-July 1, 1932); Shneur, Ḥ. n. byalik uvene doro (Ḥ. N. Bialik and his generation) (Tel Aviv: Devir, 1952/1953); Shneur, in Hadoar (New York) (June 5-July 19, 1953); Shneur, David frishman veaḥerim (David Frishman and those after him) (Tel Aviv, 1959), pp. 379ff; Ruvn Brainin, in Tog (New York) (August 27, 1932); M. Ribalov, in Hadoar (August 27, 1932); Nosn Grinblat, in Literarishe bleter (Warsaw) 38 (1932); Sefer natan goren (Volume for Natan Goren) (Tel Aviv, 1958), pp. 153ff; R. Fridkin, in Yidishe bilder (Riga) 9 (1937); Jack Lev, in Unzer ekspres (Warsaw) (August 30, 1937); F. Laḥover, Rishonim veaḥaronim (The earlier and the later ones) (Tel Aviv, 1958), see index; M. Kitay, Unzere shrayber un kinstler (Our writers and artists) (Warsaw: Jewish Universal Library, 1938), see index; Shmuel Leshtshinski, Literarishe eseyen (Literary essays) (New York: Gershuni, 1938), pp. 53-58; Hillel Tsaytlin, in Tsukunft (New York) (August 1938); M. Y. Freyd, Yamim veshanim, zikhronot vetsiyurim mitekufa shel ḥamishim shana (Days and years, memoirs and paintings from a period of fifty years), vol. 2 (Tel Aviv, 1938/1939), pp. 194-204; Y. Y. Sigal, in Keneder odler (Montreal) (May 15, 1944); Moyshe Shtarkman, in Poylisher yid (Polish Jew), annual (191944); E. R. Malachi, in Hadoar (August 1, 1947) on Frishman’s last will; A. Shteynman, in Hadoar (1947); Shteynman, in Heymish (Tel Aviv) (December 1960); Shteynman, in Davar (Tel Aviv) (May 4, 1962; September 7, 1962); Shteynman, in Idisher kemfer (New York) (March 29, 1963); Froym Kaganovski, Yidishe shrayber in der heym (Yiddish writers at home) (Lodz, 1949), pp. 67-71; Dr. A. Mukdoni, Yitskhok leybush perets un dos yidishe teater (Yitskhok Leybush Perets and Yiddish theater) (New York, 1949), see index; Nokhum Sokolov, Perzenlekhkeytn (Personalities) (Buenos Aires: Central Association of Polish Jews in Argentina, 1948), pp. 65-68ff; Y. Likhtenboym, Sofrenu, mimapu ad byalik (Our literature, from Mapu till Bialik) (Jerusalem, 1950), see index; Likhtnboym, Hasipur haivri (The Hebrew story) (Tel Aviv, 1955), see index; Aharon Ben-Or, Toldot hasifrut haivrit haḥadasha (History of modern Hebrew literature), vol. 2 (Tel Aviv, 1951), pp. 83-104; Yankev Botoshanski, in Di naye tsayt (Buenos Aires) 190 (1952); A. Kariv, in Molad (Tel Aviv) 68-69 (1951/1953); Yankev Fikhman, Regnboygn (Rainbow) (Buenos Aires, 1953), pp. 262-67; Dov Sadan, Kearat egozim o elef bediha ubediha, asufat humor be-yisrael (A bowl of nuts or one thousand and one jokes, an anthology of humor in Israel) (Tel Aviv, 1953), see index; Yoyel Mastboym, in Letste nayes (Tel Aviv) (December 25, 1953); Ben-Tsien Kats, in Tog-morgn-zhurnal (New York) (June 27, 1954; July 7, 1954; August 8, 1954); Kats, Zikhronot (Memoirs) (Tel Aviv, 1962/1963), pp. 118-26, 280; Shelomo Shreberk, Zikhronot hamotsi laor shelomo shreberk (Memoirs of a publisher, Shelomo Shreberk) (Tel Aviv: Sh. Shreberk, 1954), pp. 136-37; Moyshe Grosman, in Fun noentn over (New York) 2 (1956), pp. 13, 42, 48; Khayim Leyb Fuks, in Fun noentn over 3 (1957), see index; Avraham Shaanan, Milon hasifrut haḥadasha haivrit vehakelalit (Dictionary of modern Hebrew and general literature) (Tel Aviv, 1959), pp. 644-48; Kalmen Marmor, Mayn lebns-geshikhte (My life history), vol. 1 (New York: IKUF, 1959), pp. 318-19; Kitve r’ benyamin (The writings of Rabi Benyamin) (Jerusalem, 1959/1960), see index; Arn Tsaytlin, in Tog-morgn-zhurnal (February 19, 1960; December 21, 1962; December 17, 1965); Y. Ḥ. Ravnitski, Dor vesofrav (The generation and its writers) (Tel Aviv, 1960/1961); Sh. Pnueli, Sifrut kefshuta (Tel Aviv, 1963), pp. 252-344; Y. Emyot, In mitele yorn, eseyen, dertseylungen, lider (In middle age, essays, stories, poems) (Rochester: Jewish Community Council, 1963), pp. 169-62. See Shimen Dubnov, in Voskhod (Sunrise) VII (1889). See his letter to Y. Y. Vaysberg of August 7, 1889. See A. Mukdoni, Yitskhok leybush perets un dos yidishe teater (Yitskhok Leybush Perets and Yiddish theater) (New York, 1949). See the anthology Kneset (Assembly) (Warsaw, 1917); reprinted in Heftn far literatur (Literary notebooks) (Lodz, 1919). See Dr. A. Koralnik, Dos bukh fun vortslen (The book of roots) (Warsaw, 1928), pp. 73-78. The wife of Ben Frishvaser, she was born in Austria. She was an active leader in the Workmen’s Circle and for many years secretary of the managing committee of Forverts (Forward) in New York. She contributed in the women’s section to Forverts. She also published a cookbook in English. Source: Forverts (New York) (April 1, 1959). The husband of Regina (Perl) Frishvaser, he came from Sasov (Sasów), Galicia. He moved to the United States and became active in the Workmen’s Circle. For each Workmen’s Circle conference, he published a humorous publication Bezem (Broom), in which he would chide the elite by using humorous cartoons and jokes. He also edited Der sasover (The Sasover), a six-page publication (two pages in English). He died in New York. Sources: Der sasover (New York) 31-32 (1939); Arbeter-ring boyer un tuer (Builders and leaders of the Workmen’s Circle), ed. Y. Yeshurin and Y. Sh. Herts (New York, 1962), p. 322.